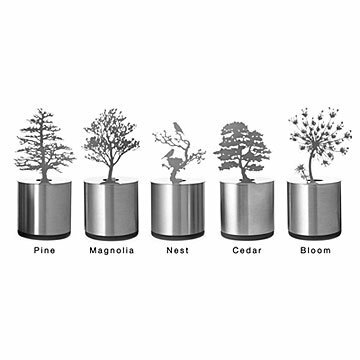 This modern oil candle illuminates a tiny stainless steel tree, casting enchanting shadows on your wall. Invented by artist Adam Frank, this modern little oil candle casts an enchanting shadow from a tiny, stainless steel tree. As the flame flickers, the shadow of the tree moves like a light breeze is rustling its branches. A unique twist on a normal candle. Give one to your favorite hostess or light several at your next dinner party. The shadow's intensity and size will be affected by additional light in the room - the darker the room, the better the results. Comes with two containers of odorless, clean-burning liquid wax that last 17 hours each. Available in five styles (from left to right): Cedar, Nest, Magnolia, Pine, and Bloom. Set of two refills also available. Made in Brooklyn. Featured in Family Circle magazine. Adam Frank experiments with light, shadow, and interaction. His pieces combine fine art, toys, and home accents, and each carries an air of mystery that blurs the line between fantasy and reality. He began his career working at George Coates Performance Works, a high-technology theater company in San Francisco, where he specialized in computer graphics and creating 3D digital environments and effects that interacted with actors on stage. Now, Adam designs and produces artwork, products, and toys that benefit from his talent for creating environments and interactive characters. His work has been exhibited and installed all over the world, including a large-scale installation of his Lucid Mirror concept at the Brooklyn Academy of Music. Truly unique and the recipient loved it! This particular gift ended up in a room that casts a beautiful shadow on the wall. The tree never appears in wall as intended only if right next to the all and casts a very small shadow. My sister put it above her fireplace, which in turn gave her living room, a beautiful forest feel, even if it was just one tree! Overall it's great. I just think the price is high for what it is. My mother loves it and has it displayed on the kitchen counter near the wall. It creates a very nice, mellow mood. It is perfect for reflection and calming one down. I brought this product for a friend. They seem to enjoy it! Hoping for a conversation starter... or making the home feel warmer. This purchase is expensive for what you get and does not work as shown.